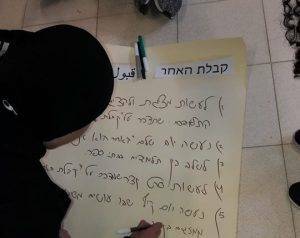 A preliminary meeting of Bridges for Peace programme coordinators, including some young coordinators, was held recently and coincided with protests by students from Southern Israel criticizing the security situation in their region. 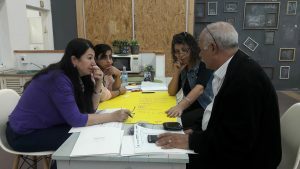 The Bridges for Peace programme is an initiative of the Israel Sci-Tech Network, in collaboration with the Peres Center for Peace and Google Inc., aiming to promote shared existence and to create opportunities for discussion and multicultural discourse through face-to-face meetings between Israeli Arabs and Jews. 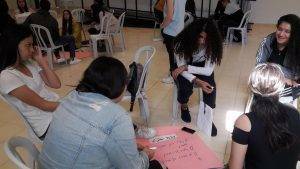 The programme’s ongoing activity throughout the year, led by Ortov, consists of bringing together pairs of schools attended by Jewish and Arab students. 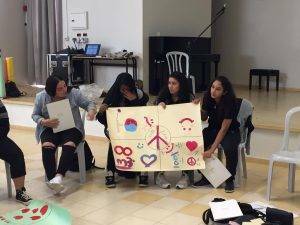 Activities include face-to-face meetings, virtual online meetings, a full-day workshop in the Peres Center for Peace, and a concluding meeting. 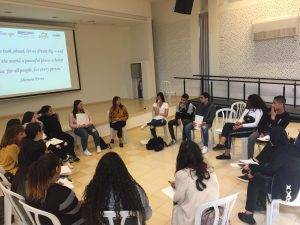 The aim of these meetings is to expand the students’ social circles, and to nurture their social responsibility and awareness for better discourse and ethics, as potential future leaders in the Israeli society. During the aforementioned meeting, students found out how their schools were paired for the coming year, and began to prepare for their prospective joint activities.